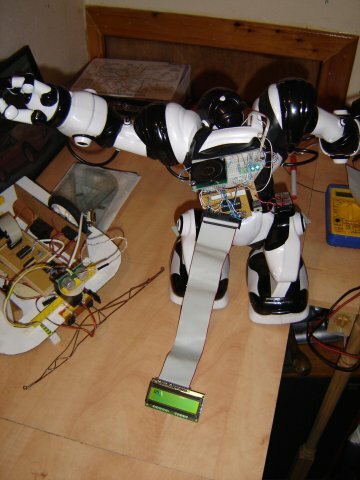 Now that I have the control of Robosapien using the PICmicro I’m going to look at some uses. IR-proximity detectors, UltraSonic Rangefinders, Light Dependant Resistors (LDRs), voice-activation (well not on a PIC obvoiusly). LEDs gallore, LCD (so you know what PICmicro/Robosapien is up to), text-to-speech transducer (SP03) (see photos below). I’m sure I’ve missed a few ideas out. At this stage I tested a few devices, namely the SP03 (text-to-speech) and an LCD. Below are some photos of the various experiments. 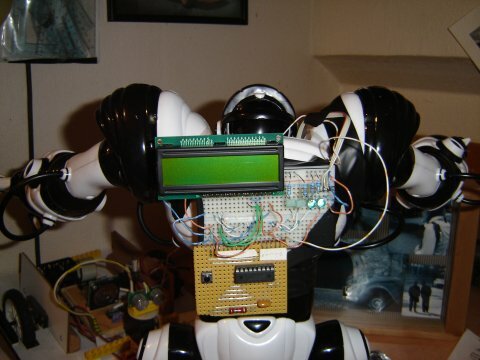 Robosapien with LCD connected to prototype board. The LCD was used to display the received IR code but gave me an idea which I’m working on just now, Robosapien Alarm Clock. 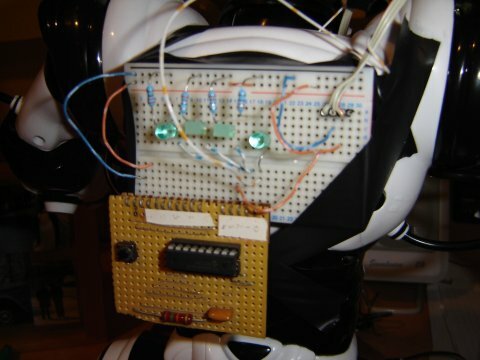 I have successfully attached the SP03 Speech synthesizer to the robosapien and can control it from my PIC using I2C (2-wire interface). In the photo you can see a 9V (PP3) battery and a connector hanging from the breadboard. Attached to the connector is a piece of stripboard with a 5v regulator, this supplies the power to the SP03. 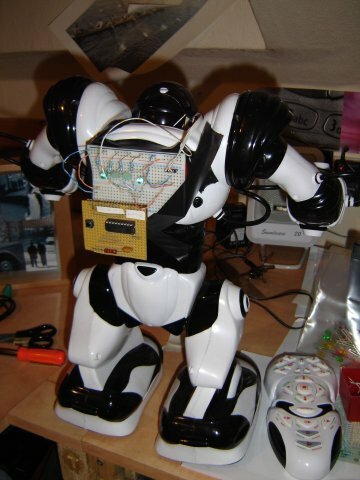 Robosapien with current prototype board taped to back. Notice that there are now 4 wires to the board. These are VCC, GND, IR-OUT (to PCB) and IRIN (from receiver in head). Close up of current prototype board. Notice that there are now 4 wires to the board. These are VCC, GND, IR-OUT (to PCB) and IRIN (from receiver in head).